Create a simple document or great works of literature! Atlantis Word Processor 2.0.5 was available as a giveaway on March 9, 2017! Atlantis Word Processor has all the features you need to create simple documents or great works of literature. The Atlantis interface is entirely customizable: menus, toolbars, hot keys, colors and sounds can all be adjusted to suit your own requirements. Make eBooks for a living, or just create eBooks to read on any device. 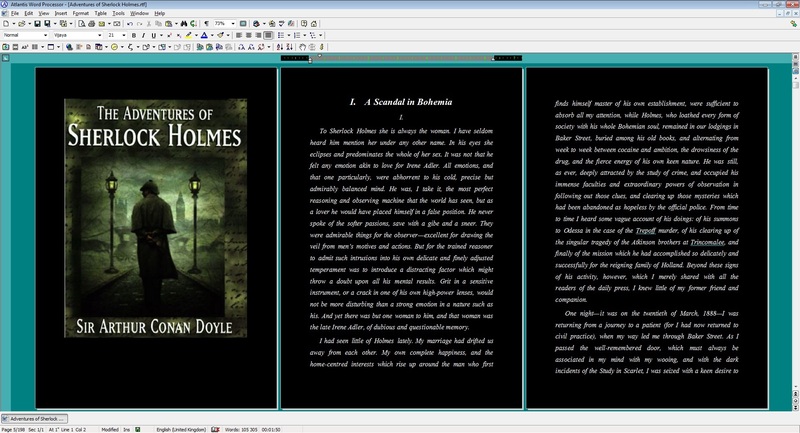 Turn any document into an eBook with just a few mouse clicks! Last but not least, Atlantis Word Processor is compact, stable, and it loads and works very fast. How would you improve Atlantis Word Processor 2.0.5? begin page numbering where I want it to begin. This is one of the best licenses that GOTD has had for a long time. A quit test so far, it may be my go to text program and will pay for a license. Thank You for the gem! Have used this from prior giveaway...it's outstanding as indicated by the vast majority of the GOTD community today. Thanks, Atlantis and GOTD. And, BTW, finally a product w/o convoluted registering and lack of related complaints! I wrote a letter and saved it in a particular place but, the file message reports it cannot be found. When I look in the thumbdrive where the program is looking for the letter it is not listed in the directory. Also when I look for it where I "thought" it should be the file is not listed. I even by using my file search program the file cannot be found. I searched both by name and date. Walter Green, Please choose the "File | Recent Documents" menu command of Atlantis Word Processor. Most probably your document is still listed there. Rob Down Under, You can easily move entire selected rows with Drag & Drop, or by pressing Ctrl+Shift+Up / Ctrl+Shift+Down keys. I thought I had tried it with Atlantis, with no success. Rob Crombie, You are right. The correct key is Shift+Alt+Up / Down. WOW the download and instalation was so fast I thought it failed. I had a XP laptop with Atlantis1.6 installed. I just downloaded and installed the new version over top without any problems. Clicking on the old icon opened the new version :-). definitely two thumbs up from me (well, i guess i can only do one thumb). i had the former version, 1.6.6.5, this is 2.0.5.0.
i wasn't sure if i should uninstall the former program first, i didn't. it seemed to install right over it, and everything seems fine. the one thing i miss, just like the older one, is that this program does not convert to pdf. it asked me what files it should open. i clicked on the files, but it doesn't open them directly, it asks which program to open my files, so i'll have to do it separately even though i thought i'd taken care of it by checking the boxes for the various files. definitely two thumbs up from me (well, i guess i can only do one thumb). i had the former version, 1.6.6.5, this is 2.0.5.0. i wasn't sure if i should uninstall the former program first, i didn't. it seemed to install right over it, and everything seems fine. the one thing i miss, just like the older one, is that this program does not convert to pdf. it asked me what files it should open. i clicked on the files, but it doesn't open them directly, it asks which program to open my files, so i'll have to do it separately even though i thought i'd taken care of it by checking the boxes for the various files. The create-an-eBook feature will be useful to some, no doubt. Otherwise, why not just use Wordpad which comes with Windows? starvinmarvin, Please check out the >Summary of features of Atlantis Word Processor. It has a lot to offer compared to WordPad. starvinmarvin, Please check out the <a href="http://www.atlantiswordprocessor.com/en/features.htm"<strong>>Summary of features of Atlantis Word Processor</strong></a>. It has a lot to offer compared to WordPad. So you cannot use different sources for printing. Looks like you have to set up printer to print on paper then separately set up source for envelopes. Then back again for paper source? They should be kept apart as in Word. So you cannot use different sources for printing. Looks like you have to set up printer to print on paper then separately set up source for envelopes. Then back again for paper source? Strange idea. They should be kept apart as in Word. I was looking for something to use as a faster word processor instead of MS Word to work on simple DOC documents. I tried OO, Wordpad, and a bunch of other ones. Today, GAOTD is offering something I didn't know about. I installed it, and so far it's the fastest Word processor of them all! And it's the best and fastest Registration process on all GAOTD sofwares I tried in the past. 2. Run the "Tools / Install to Removable Drive...", and follow instructions. That's it! I already installed it on my laptop as a portable tool. I was looking for something to use as a faster word processor instead of MS Word to work on simple DOC documents. I tried OO, Wordpad, and a bunch of other ones. Today, GAOTD is offering something I didn't know about. I installed it, and so far it's the fastest Word processor of them all! And it's the best and fastest Registration process on all GAOTD sofwares I tried in the past. Oh, and did I say you can make it portable... No, someone else said it before me. I know there's a link but here is the procedure to make it portable: 1. Launch Atlantis. 2. Run the "Tools / Install to Removable Drive...", and follow instructions. That's it! I already installed it on my laptop as a portable tool. Thanks to Atlantis! Jack Kerr, You can create a portable copy of Atlantis Word Processor without installing to a PC. Just run the setup file of Atlantis, and specify a folder on a removable drive as a destination. Hello my name is John, The Guru Bee at askthe.SoftwareReview.Guru and I would like to tell you about a great piece of software called “Atlantis Word Processor” this is a simple yet effective Epub that’s E-Publisher for anyone not knowing the terms that like to get used in the software industry. It lets you create a file which can be read by almost all the leading hardware and software for this sort of thing. Now the interesting part about “Atlantis Word Processor” is the speed and simple operation of the program and how easy it is to simply add key press sounds, the sounds seem to really help the creative juices with each press you just want to press the next letter. So just for this single point it’s really worth trying if your a writer who gets writer's block once in a blue moon and what is this sound I hear you cry that Atlantis has provided us. The sound is a classic typewriter sound. There are many other sounds that accompany this program all of which can be switched on and off in the options menu located under tools. The software itself is small in size, so loads fast for that all important article that just broke your sleep and it's portable so you can store it on a USB and carry it to any computer you need too. great if your planning a trip and want to leave the laptop at home, yet still want some familiarity in the software you use. Don’t expect a modern interface however, you feel like you have just been transported back in time to 1999 with a not so pixel perfect icon set, which somehow is pleasing. Your guaranteed to know well if you have spent any time in the last 15 or so years near a computer. The layout is all familiar coming directly from the Microsoft and Co. camp. If not you can try Atlantis Word Processor on a "try-before-you-buy" basis. You can install Atlantis Word Processor to your computer, and evaluate it for up to 30 days for free. I should say that the links and the article are in no way affiliated with either the giveawayoftheday.com or AtlantisWordProcessor.com sites. Hello my name is John, The Guru Bee at askthe.SoftwareReview.Guru and I would like to tell you about a great piece of software called “Atlantis Word Processor” this is a simple yet effective Epub that’s E-Publisher for anyone not knowing the terms that like to get used in the software industry. It lets you create a file which can be read by almost all the leading hardware and software for this sort of thing. We are talking about creating a book which can be read on Kindle, Apple devices, on your computer at home or on a smart device from your pocket like e-readers or mobile phones. 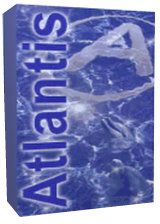 Now the interesting part about “Atlantis Word Processor” is the speed and simple operation of the program and how easy it is to simply add key press sounds, the sounds seem to really help the creative juices with each press you just want to press the next letter. So just for this single point it’s really worth trying if your a writer who gets writer's block once in a blue moon and what is this sound I hear you cry that Atlantis has provided us. The sound is a classic typewriter sound. There are many other sounds that accompany this program all of which can be switched on and off in the options menu located under tools. The software itself is small in size, so loads fast for that all important article that just broke your sleep and it's portable so you can store it on a USB and carry it to any computer you need too. great if your planning a trip and want to leave the laptop at home, yet still want some familiarity in the software you use. Don’t expect a modern interface however, you feel like you have just been transported back in time to 1999 with a not so pixel perfect icon set, which somehow is pleasing. Your guaranteed to know well if you have spent any time in the last 15 or so years near a computer. The layout is all familiar coming directly from the Microsoft and Co. camp. So how much is this little dream going to cost you, well I got my version for free from a site called, giveawayoftheday, now I should say that just because it is a freebee, doesn’t mean that it not worth every penny. If your lucky you can go directly to the link and download the application for free at https://www.giveawayoftheday.com/atlantis-word-processor If not you can try Atlantis Word Processor on a "try-before-you-buy" basis. You can install Atlantis Word Processor to your computer, and evaluate it for up to 30 days for free. Remember to install the extra sounds from the Atlantis Word Processor Downloads page I should say that the links and the article are in no way affiliated with either the giveawayoftheday.com or AtlantisWordProcessor.com sites. I tried to install this at 9:38am (Pacific time) on 3/9/2017 and when I run the setup.exe it says "The giveaway period for this software is over." What's up with that? My bad. I accidentally was running the setup for my older version of Atlantis. I will try again. All is well. Altantis is now installed. This is an amazingly rich featured word processor. I have been using the version from the previous GiveAway and it fit most of my needs. I purchased a newer version for my wife since she needed tables capability which the newer version had. She likes it too. It is well worth the price. All is well. Altantis is now installed. This is an amazingly rich featured word processor. I have been using the version from the previous GiveAway and it fit most of my needs. I purchased a newer version for my wife since she needed tables capability which the newer version had. She likes it too. It is well worth the price. Installs on XP SP3 box but won't open. Buckley, it opens fine on my XP SP3. This is a nice uncomplicated giveaway, no GAOTD wrapper so will install without complications. The installation is remarkebly clean with no DLL's just the program executable, a hyphenation data file if we leave that module selected during installation, an installation log file and a license text file. No need to worry about registration as it is the full version as is. Contrary to other comments the program DOES NOT install as a portable program by default! It also installs files into either system wide application data sub folder or user application data sub folder called Atlantis depending on if you select install for all users or not. As well as a start menu and all user or current user desktop shortcut respectively. To get the portable install on a USB stick done just go to the Tools menu in the program and activate the "Install to Removable Drive..." and follow the prompts, then that becomes portable with all the intended portable features. 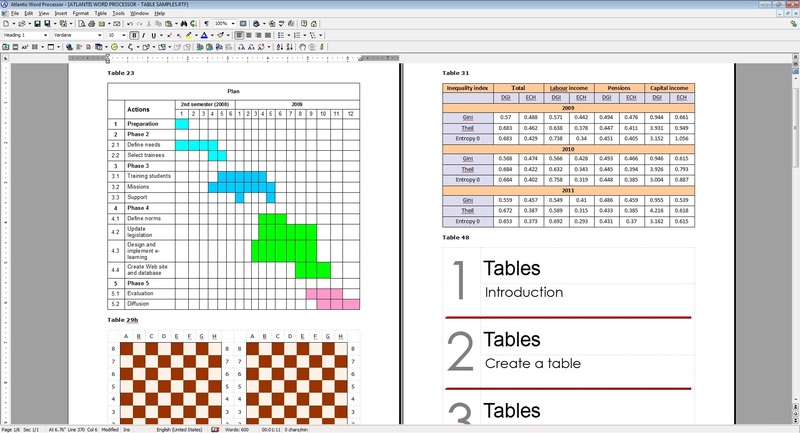 TK, You can create a portable copy of Atlantis Word Processor without installing to a PC. Just run the setup file of Atlantis, and specify a folder on a removable drive as a destination. I like this new version software and have been using the older version. It is very good (regardless of whether portable or not). Why do some users insist this Version 2.0.5.0 is portable? When I check Revo Uninstaller this software is listed as an Installed Software. I have checked other truly portable software and Revo Uninstaller does not list them. I used Regseeker to check and found 17 entries in Registry related to this software. I like this new version software and have been using the older version. It is very good (regardless of whether portable or not). But.... Why do some users insist this Version 2.0.5.0 is portable? When I check Revo Uninstaller this software is listed as an Installed Software. I have checked other truly portable software and Revo Uninstaller does not list them. I used Regseeker to check and found 17 entries in Registry related to this software. ric, It installs as a regular program. Then, launched, it has an option under Tools - that allows a copy of the program to be saved as a portable on an external media. I "installed" to downloads, then moved this folder to other computers where it works just fine - so that makes it portable to me. ric, I "installed" to downloads, then moved this folder to other computers where it works just fine - so that makes it portable to me. Nigel, Copying the home folder of Atlantis from a hard drive to a USB stick will not work. A number of important files would be still missing. To create a portable copy of Atlantis Word Processor, run the setup file of Atlantis, and specify a folder on a removable drive as a destination. Nigel, Copying the home folder of Atlantis from a hard drive to a USB stick will not work. A number of important files would be still missing. To create a portable copy of Atlantis Word Processor, run the setup file of Atlantis, and specify a folder on a removable drive as a destination. if I d/l it to my pc, can I put it on a flash drive afterward? maggy, yes, after you install it on your pc you can make a portable copy on a removable flash drive using the Tools menu option "Install to Removable Drive..."
Always liked this little software for its small footprint. It still misses the ability to produce PDF internally. Don't know why, because it's easy (see PDF plugin for IrfanView and ReportLab). Imported a .odt file. Good enough because the file contains a text frame, something that is unknown to Atlantis. Always liked this little software for its small footprint. It still misses the ability to produce PDF internally. Don't know why, because it's easy (see PDF plugin for IrfanView and ReportLab). Imported a .odt file. Good enough because the file contains a text frame, something that is unknown to Atlantis. 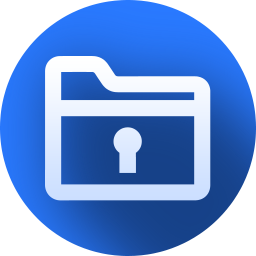 Any document created in Atlantis can be saved as a PDF file, i.e. automatically converted to the PDF format, provided that a "virtual PDF printer" is installed on your PC. Please note that these virtual PDF "printers" do not actually print documents, they only place a PDF version of the original document on your disk. If your system has no virtual PDF printer, you will find related links in the "Free Tools" section of the Atlantis Downloads page. papin, with the exception of some utilities like the DoPDF printer driver, most PDF generators might be somewhat larger in MB right? Also, I read something about the need to install the PDF printer driver on the machine, i.e. not portable. a) I've been using PDF Creator for many years, since version 1.
b) I said "internally": OO/LO have been producing PDF without virtual PDF printer for a long time --that's exactly what I meant. Colja, a) I've been using PDF Creator for many years, since version 1. b) I said "internally": OO/LO have been producing PDF without virtual PDF printer for a long time --that's exactly what I meant. Should Atlantis produce a PDF without some external PDF printer, the software would be totally portable. m, Should Atlantis produce a PDF without some external PDF printer, the software would be totally portable. Kamm, Sorry, you cannot add videos. Nice to see tables working in this release. "The only frustrating thing was trying to find out what the price is"
It's at the top of this page, where it says $35.00 - Free today. @Anairb "The only frustrating thing was trying to find out what the price is" It's at the top of this page, where it says <strike>$35.00 </strike>- Free today. I tryed to type "Lỗi tự động thêm khoảng trắng trước ký tự có dấu"
and I got "L ỗi t ự đ ộng th êm kho ảng tr ắng tr ư ớc k ý t ự c ó d ấu"
It got mistakes when typing Vietnamese: I tryed to type "Lỗi tự động thêm khoảng trắng trước ký tự có dấu" and I got "L ỗi t ự đ ộng th êm kho ảng tr ắng tr ư ớc k ý t ự c ó d ấu"
does this do scientific notation and mathematical notation such as square and square root? george james ducas, They can be inserted as ordinary graphics. This is a lovely word processor. I used it for many years - until they removed the wonderful help file from the package and put it online. If you don't mind that, this is worth the download. Atlantis is my go to word processor. It does everything I need most of the time in word processing. I have Office 365, but since I don't want to wait 15-30 seconds to open or create a document I go straight to Atlantis. A first-rate program, being portable has tremendous advantages. When doing my postgrad work in computers printing my projects was a nightmare. They had to be done on a laser printer and these were only available at University. On opening a Word document all the formatting would be lost unless the two normal.dot templates were the same. It was never the same and a great deal of time was wasted reformatting the document for that particular template. Being portable means that when going from one computer to the next does not affect the document formatting in any way. This program would have been a godsend in my university days and I'm pretty sure that today's students will find this program really useful. A first-rate program, being portable has tremendous advantages. When doing my postgrad work in computers printing my projects was a nightmare. They had to be done on a laser printer and these were only available at University. 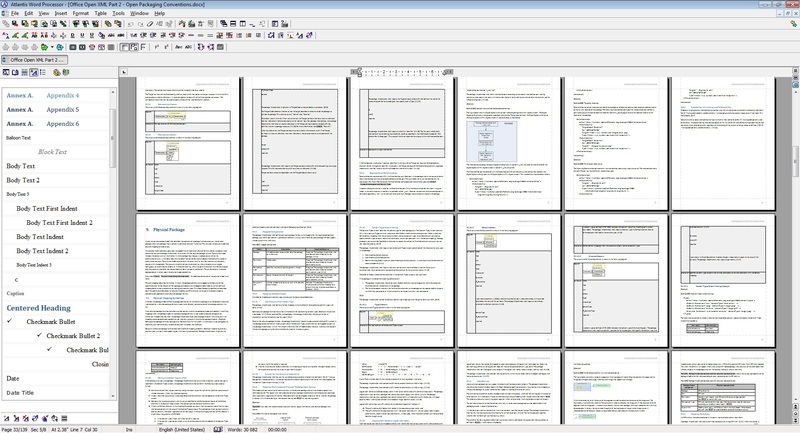 On opening a Word document all the formatting would be lost unless the two normal.dot templates were the same. It was never the same and a great deal of time was wasted reformatting the document for that particular template. Being portable means that when going from one computer to the next does not affect the document formatting in any way. This program would have been a godsend in my university days and I'm pretty sure that today's students will find this program really useful. Good, light MS Word replacement. I use the the version 1.6.6.1 from previous giveaway time to time, so I gladly upgrade now. And what is best, when installed on flash drive, Atlantis works as PORTABLE app (I have just quickly tested this version, too). Good, light MS Word replacement. I use the the version 1.6.6.1 from previous giveaway time to time, so I gladly upgrade now. And what is best, when installed on flash drive, Atlantis works as PORTABLE app (I have just quickly tested this version, too). Can this be made portable as per the last "Giveaway" on December 4, 2015? Nigel - YES, I just tried it. It installs solely as portable, a point that should be "pushed" in the advertising to make it a more attractive purchase. No messing with registrations either. Nigel, It installs solely as portable, a point that should be "pushed" in the advertising to make it a more attractive purchase. No messing with registrations either. Of course! Here is a short guide to do that. Nigel, Yes, it's fully PORTABLE. Just install it on a USB flash drive and you are ready to go! I had trouble installing the desktop version, (Linux geeks may find it a piece of cake) so I simply copied the USB portable version into my Home directory. So far, it seems to work well. Mario and all, Thought you mike like to know that the portable version will run under Linux. (I've copied it to my Zorin installation, but there are so many flavo(u)rs of Linux out there I can't promise it'll work for you.) I had trouble installing the desktop version, (Linux geeks may find it a piece of cake) so I simply copied the USB portable version into my Home directory. So far, it seems to work well. Thanks GOTD and Atlanis. download & run setup, this time pc smart screen fly out & block. read the provided info, say "unknown publisher". ignore & run setup, result is everything looks like ok.
checked it is registered to GOTD. a simple setup process for this offer. anyway the layout is look familiar, as i did not use m/s word long long time. By reading this "Make eBooks for a living, or just create eBooks to read on any device" I thought I will be able to edit an epub file , but NO I can't. I loaded epub file and got an half supported file type error. So just after 10 seconds I uninstalled this GOTD. By reading this "Make eBooks for a living, or just create eBooks to read on any device" I thought I will be able to edit an epub file , but NO I can't. I loaded epub file and got an half supported file type error. So just after 10 seconds I uninstalled this GOTD. adif, Add the file you need to edit to Calibre. Convert the file to a docx then open in Atlantis and you will be able to edit the file. KyBunnies, this is a strange reply. the atlantis description claims to relate to ebook, but its relation is just as flimsy as notepad is related. KyBunnies, this is a strange reply. the atlantis description claims to relate to ebook, but its relation is just as flimsy as notepad is related. your reply was irrelevant. adif, Sorry you feel that way. However it is a great tool to edit epub files. Since you want to edit epub files it is very easy with Calibre and my reply was not irrelevant. I answered your question. But since you do not like my response why didn't you download the add-on for Atlantis from their site which opens epub files so you are able to edit them? adif, Sorry you feel that way. However it is a great tool to edit epub files. Since you want to edit epub files it is very easy with Calibre and my reply was not irrelevant. I answered your question. But since you do not like my response why didn't you download the add-on for Atlantis from their site which opens epub files so you are able to edit them? It certainly looks interesting, and the Help Pages are VERY thorough. The only frustrating thing was trying to find out what the price is (If it's good I would recommend it to the writers I teach...). Finally had to google it. It's on the Registration page - $35. adif, there's an impressive help page which answers your question here: http://www.atlantiswordprocessor.com/en/help/ebook.htm and another one on modifying ePubs here: http://www.atlantiswordprocessor.com/en/help/tweak_epub.htm It certainly looks interesting, and the Help Pages are VERY thorough. The only frustrating thing was trying to find out what the price is (If it's good I would recommend it to the writers I teach...). Finally had to google it. It's on the Registration page - $35. "Save special" gives you the "save as epub" option. Not particularly flimsy. 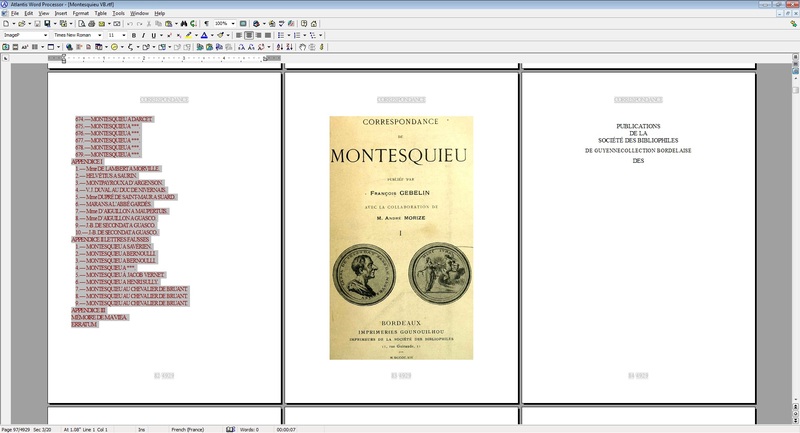 Create and edit in a common document format and save the final to epub. Anairb, I took a look at this "tweak epub" link, maybe you didn't. On that link one can learn how to tweak epub without atlantis at all. 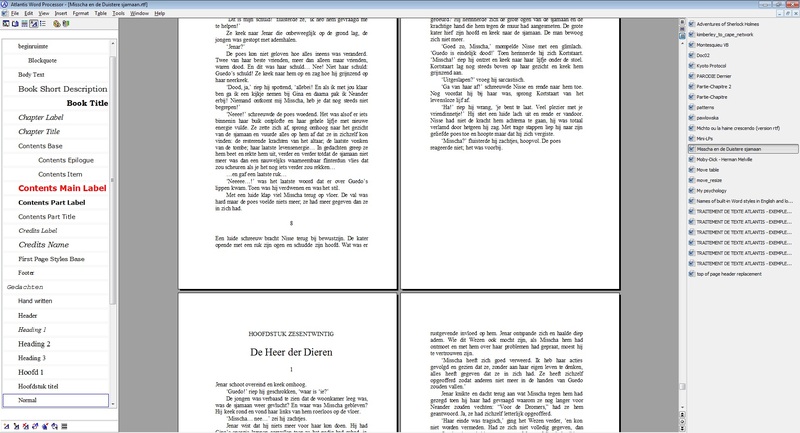 They are using notepad to tweak the epub in their screen shots. KyBunnies, :-) You made me smile. adif, if you read it AS written it is claiming to make or create ebooks NOT edit a pre-existing ebook, you type/import text format as desired save in native format and when you are done creating... save as epub... and as claimed an ebook is created/made.